Well, it’s official. In case you missed it, last month, the Bemis Center for Contemporary Arts unceremoniously removed the signage from its former Underground entrance, after the former venue lay dormant for more than a year. But with the changing of Bemis’ guard in 2013, which included the departure of Director Mark Masuoka, Chief Curator Hesse McGraw and then Underground Director Joel Damon, the venue closed up shop for good. At that time Bemis board member Todd Simon said…”we made the decision to bring the activities at the Underground galleries under the same umbrella as the rest of its exhibition and community arts programs…” And with that, the space went into hiatus until now. Will it ever reopen, in one form or another? Not likely in its former guise what with Bemis’ new direction and vision well underway dedicated to a renewed emphasis on its international residency program and its commitment to its community arts programs, but that’s another story waiting to be told. Meanwhile, Underground founders Mark Masuoka and Jeremy Stern, subsequent BU directors Brigitte McQueen and Joel Damon, former Chief Curator Hesse McGraw and a few artists who exhibited there, including Rob Gilmer, Tim Guthrie, and Josh Powell, as well as this writer, share their memories and comments on the Underground’s significance and its passing. Why then was the Underground ultimately and finally closed? Amidst various rumors and speculation, the obvious answer points to the need for any arts institution to periodically reevaluate its financial priorities and mission statement. New Bemis director Adam Price, who arrived in Omaha well after the venue’s closing, confirmed this recently. “The Underground was closed because, at the end of the day, the Bemis is not primarily an exhibition venue,” Price said, “and the Board wanted the organization to find ways to engage with the Nebraska arts community by providing more meaningful residency opportunities. The Underground began as a pet project of Masuoka and his assistant director, Jeremy Stern, who went on to be the BU’s first director, after seeing a Tugboat Gallery opening in 2004 in the basement of Gomez Art Supply in Lincoln. Excited by the vibe there and encouraged by a growing consensus in Omaha for an alternative-type gallery, Masuoka decided to open one at Bemis two years later after waiting for it to gestate somewhere else. The new venue was established as a curatorial residency for Omaha and regional artists as well as a gallery to expand Bemis’ exhibition programs. The Underground was intended to launch with no budget or funding, Masuoka said, but a month before its opening in 2006 with its first show by artist Scott Blake, the Warhol Foundation gave Bemis a two-year grant which included the Underground. Stern, the Exhibitions and Programs Manager at the Creative Alliance in Baltimore, Maryland, is also proud of the Underground’s 17 show’s that he helped direct beginning with Scott Blake’s Bring Your Bar Codes. This highly inventive exhibit made the front page of the Omaha World Herald and “brought in a lot of audience and sustained the creative energy of people who wanted to try out their new, grand ideas.” But he said the community-based experiment in the basement of the Bemis served another purpose. During that time of transition, the venue’s emphasis became more about the show than the space itself; something Tim Guthrie and Rob Gilmer, two of its artist/curators, as well as most avid supporters over the years, noticed as well. “I think the Underground was at its greatest when it was a space that was truly transformed in an experimental way the traditional (galleries) of the Bemis couldn’t really match,” said Guthrie, who virtually bookended the venue with two of its most significant and popular multi-media and group installations, Nuclear Dichotomies with brother Ken and Extraordinary Rendition with Justin Kemerling, Doug Hayko and a host of others. Gilmer agrees that from the beginning, “the standards were set very high. Bemis wanted the focus of the space to be conceptual for emerging artists on a specific theme or topic.” To that end, with Sterns’ aid and encouragement, he converted the Underground from a sprawling maze of angular sightlines, cozy corners and inner sanctums into a welcoming Dream House on Rye, room after room imagined and created by many artists including Sora Kimberlain, Sheila Malone, Gilmer and the late Wanda Ewing. Nevertheless, in spite of these growing pains as the venue evolved after Stern’s prolific contribution, the Underground enjoyed several successful shows during the Ziegler/Lynch era including The Saturday Art Series curated by Lynch, Fudgelock curated by George Sisson and the superior exhibits, Nest Egg by Bryce Speed and Eric Wilson and Matt Carlson and Phillip Faulkner’s Vision/Re-Envision. 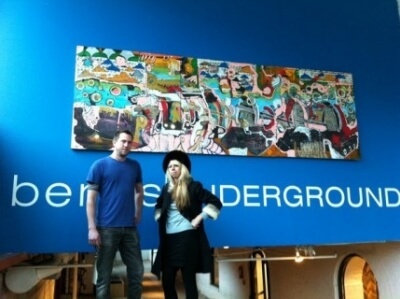 Ziegler and Nic Bartlett also enjoyed a fine Underground installation of their own titled Remainder. Yet after two years of alternating pop-ups and curated show, in 2010 Masuoka hired Brigitte McQueen, the current Director of the Union for Contemporary Art, to restore order and to change course a bit in the Underground. McQueen’s considerable talent and credentials had already been established with her gallery, Pulp, and Masuoka was impressed with its organization, which she now admits may have been a mixed blessing. “I believe that (Underground) became more formalized under my direction,” McQueen said. “It was one of Masuoka’s criteria for re-opening the space. We brought the Underground more in-line with the standards of the Bemis, which in hindsight was maybe both a good and bad thing. Nevertheless, she is justifiably proud of her brief one-year tenure as Manager of the Underground, which had, she says, its own unique set of challenges. The above may be too fine a point for some, but the reality of placing experimental, even alternative work in a formal setting may have been “out of place” in any underground, as it were. Still, McQueen managed to continue BU’s tradition of exceptional exhibits including those by some of her favorites, “Rebecca Herskovitz, Caleb Coppock, Ying Zhu, Christine Stormberg, Tana Quincy, Alex Myers,” among others. When McQueen left in December of 2010, it was lights out for nearly a year before Joel “Mighty” Damon was named new Underground director and the venue lost some of its polish even as it began to stretch under McGraw’s influence. It was a relatively successful collaboration that lasted nearly two years. Once again, Bemis attempted to have it both ways with alternative exhibits such as Golden Guts that eschewed the gallery setting and the more sophisticated Juried exhibitions that took advantage of it. That last show, What goes down must come up: Trial. Ascension. Requisite. I, along with Kjell Peterson’s From the redwood forests were among Damon’s favorites. Perhaps they best defined the Underground’s last days, as it typified the Damon/McGraw collaboration to question not only the meaning of art, but the process of creating it as well. The BU then was not only about experimental art, but a grand experiment itself in art’s relationship with time and space. At its peak it favored artists even as it challenged them. And, as one of its last artists there, Josh Powell, can attest, “Emerging artists wanted to show in the Underground because it was a big step for them and their career. That life-changing experience in the Underground was witnessed by McGraw who says, “Many of the artists have moved forward in their lives and careers and have excelled.” He cites the staff as well, including the impact the venue had on McQueen and Damon who are in agreement. The Bemis has awakened under its new leadership and vision. But how and if its considerable space below ground rises again, like the proverbial Phoenix, to restore its arts vibe remains to be seen. And with that, the doors closed and the Underground passed into history. But not before it played a vital role in the Metro’s emerging art scene. True it had its missteps, and its critics, and yes it did offend some provincial sensibilities. But in retrospect, isn’t that the nature of experimentation and the avant garde? Aren’t the rewards worth the risks? When and where did art and “safe” successfully share the same space? Not in the Underground. Even its worst shows—and in six years of reviewing them, there were some clunkers—the single best thing this mercurial venue did better than anywhere else, was to offer artists a chance to express their own concept, then lend a hand or otherwise get out of their way. The Underground was at its best when Bemis gave up some of its natural tendency to want to control or micromanage the freedom it fostered. That’s an experiment too that only the strongest arts venues dare attempt, and at days’ end it has little to do with the art on the wall. The Underground’s days are over. Will anyone in this burg follow its example? That too is another story.